Another most productive day as many small but essential tasks were drawn to a conclusion. The PWT set sail by Landrover and dealt with a variety of snagging jobs that included a temporary solution to a broken up insulated joint just north of Idridgehay crossing and replacement of more bullhead fishplate bolts by approved flat bottom bolts. Rubbish that had accumulated adjacent to Barnsley Lane bridge was cleared reminding us that we shouldn't be amazed how some people treat the Railway as a convenient tip. The track has now been walked between Wirksworth and Duffield allowing for the appropriate reports to be compiled as to its present condition which I happy to say can be declared safe for next week's excitements. The VCT basked in the glory of completing their work at Duffield and managed to transport several loads of brash to the burning site. It was reported that they achieved a giant fire which has ensured many of the team do no need immediate hair cuts. They also righted two sheep topping Tony's measly one last Sunday. The S&T department erected signs that have rested in my office for some time to label the ground frames at Shottle and Duffield. They also managed to dispose of the projecting supports for the former Vodaphone tower at Duffield. Alex, Lewis and Richard spent the day cleaning and polishing D8001 which will be the standby locomotive next Wednesday and whilst steam has featured for obvious reasons we mustn't forget how valuable this machine is to our day to day life and revenue. So a photo is attached. The SK had further work to ensure its toilets work and the LMSCA didn't go on holiday for two days, they were back again to strengthen the varnish finish in the Third Open. The Saloon had the south end compartment's carpet shampooed and further research into filling the toilet tank. The lone carriage cleaner worked through the 3 car dmu finding a lot of condensation gathering on the internal window sills. We will have to be careful to wipe these off before the first train of the day when the ambient weather conditions generate this unwanted water bath. Antimacassars were applied to the SK to give that extra feeling of luxury. Duffield saw the Perspex sheets arrive and applied to the shelter between the Cabin and the garages. At least we have a little undercover accommodation now. More cream paint was applied to the Midland Railway lamp posts. The heros of the day were the PWT who had a long day but cracked off five essential jobs. Two of them were the reinstatement of the last foot crossings removed for the passage of the tamper and a further two were drilling fishplate holes in rails that never appeared to have had a full set. We now have all fishplates with the requisite number of holes and bolts. The fifth task achieved was the replacement of a cracked fishplate. In addition they have delivered another load of logs to the distribution siding at Shottle. A very well done to all concerned. The LMSCA were in evidence as they continued with electrical work, door lock maintenance and the application of internal transfers. I overheard a suggestion that they were taking two days off and cannot believe that this is true! Mysteries surrounding the propane gas supplies to the water boiler in the Saloon have been finally solved and, again, thanks are due to the people that cracked this problem. Quite important with the upcoming travellers in the vehicle. Carriage cleaning continued so that the presentation of our fleet will be pristine and further work was undertaken on the dmu fleet. The Booking Hall dealt with the opening weekend bookings and many acceptances from the movers and shakers that have been invited through the five day extravaganza. In the bowels of the organisation continued preparation for our inspection on Friday continued. Another most productive day with, again, some 60 volunteers achieving a great deal of work in many areas. The Works Train departed for Duffield and the team inserted two base plates that were lacking in the southern crossover there. The train assisted the VCT to move brash to the burning site and cleansed the lineside of a wagon load of logs which will be sold from Shottle Yard. The VCT approached the conclusion of their fencing work at Duffield and moved surplus material to their depot at Hazelwood. The end product will be viewed by all before too long and reflects great credit on all involved. The Duffield platform team continued painting anything that was fixed down and the supports for the new canopy between the developers garages and our own building were readied for receipt of sheeting on Thursday. The LMSCA have been out in force and continued their final snagging of the Third Open and the DST continued putting Henry Ellison back together. The station at Wirksworth has benefited from the application of more bedding plants and Idridgehay has had attention to the grassed area opposite the Platform. Wirksworth station has had improvements to the disabled car parking area and associated signage. Perhaps the major physical change to our Railway today has been the Annetts Locks fitted to Shottle North together with Duffield North and South ground frames. This engineering together with the application of lever plates and anti slip meshing fitted to the ground frame platforms has moved us towards conclusion of this stage of our project. 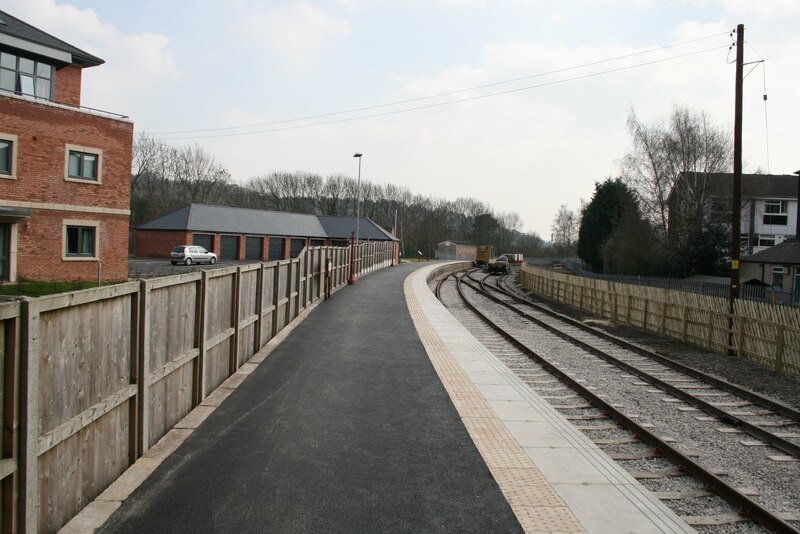 A walkway across the rodding at Duffield North has reduced the tripping hazards for the train crew and the facing point lock covers have been fitted at all locations. This part of our enterprise driven by Mick Thomas and assisted by Richard Hatch and Bob Grange could not have been undertaken by anyone else in our team and my thanks go out to them for a job very well done. The Booking Hall had a successful day dealing with opening bookings, guest requirements and encouraging group reservations. A new version of the stock list is available for download from the "Enthusiasts" section of the website. It reflects all of the recent comings and goings, including today. The lone fishplate bolt changer reports some 15 bolts dealt with in the Hazelwood area and the supplementary task of a ewe uprighted. This is a new skill for the Permanent Way staff which is a task that has not been properly risk assessed and the appropriate documentation produced but I am sure training courses will be arranged in the near future. However, for the time being - well done Tony! The LMSCA were in evidence after yesterday's enjoyment with a serious sealing of the gutters on the west side of the vehicle and further work on the electrics which allow the lights to be switched on by the touch of a button. The installation also allows for a shore supply to be plugged in to enable essential vacuum cleaning to be carried out after tickets have been nipped. Also achieved today was the application of lining above the windows which will be matched later in the week by the under window stripes. Duffield reports the successful mowing of the grass at the north end of the old down slow platform, the completion of a further seat and more undercoating of the lamp posts, interpretation board supports and the heritage gate post. At Wirksworth there was further tidying and painting of structures together with the delineation of disabled car parking spaces. 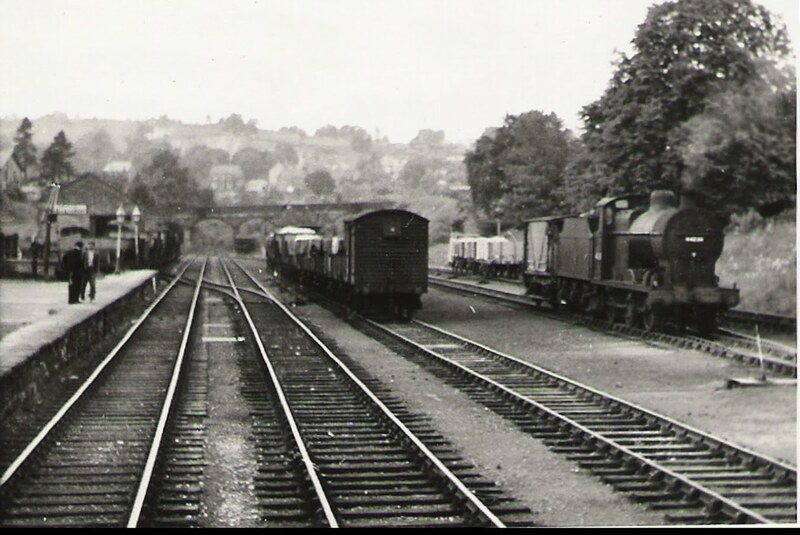 There was much activity in Wirksworth Car Park that at times resembled a heavy haulage yard. Tommy and Hydra have now departed to the LH Group at Barton-under-Needwood to emerge at some time as "new" locomotives. They have been problematic for us and not a very wise buy. I hope they have a more successful future with the Hunslet Engine Company. 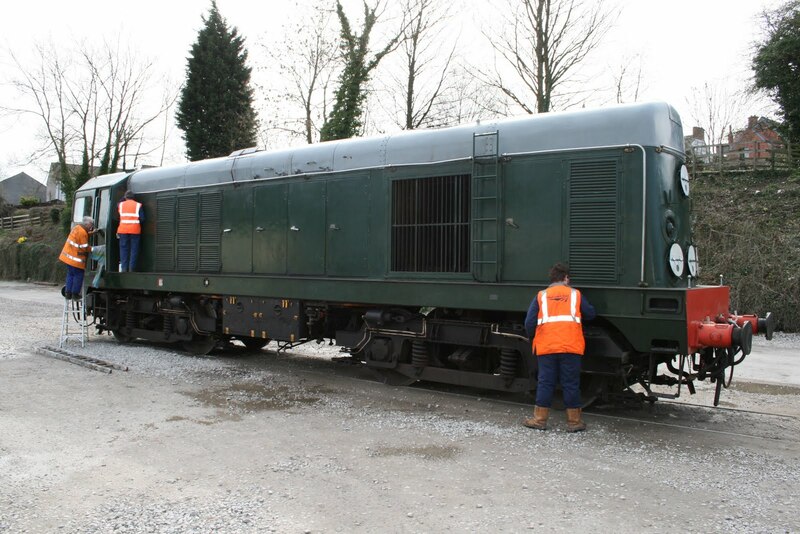 We have taken delivery of Met-Cam Driving Motor Brake Composite E50170 from the Midland Railway Centre. This is in a deep green livery that matches the centre car and will release E51505 to be the steam trailer car for the Ravenstor service. We can say we now have the most well restored and presented dmu fleet of any heritage railway. The PWT and VCT will be concentrating on cleansing Duffield and the north thereof so we have no lineside debris by the end of the week. The Works Train is pre-assembled for a prompt departure from Wirksworth tomorrow. A general reminder to all operating staff that the ground frames at Shottle and Duffield will only be operable with the token by Thursday of this week. Anton will have his own take on the day as Responsible Officer for the time after we undertook a rehearsal for our Royal visit. The locomotive crew from the Great Central Railway were remarkably pleasant, and very tolerant, given that we had never operated a loco hauled train to and from Duffield and one of the coaches in the train had only been released for use the day before. The exercise involved a number of people and I thank them for giving up the day to engage in this trial. The whole process was most useful and highlighted areas that we have to improve on. I cannot express how pleasurable it was to journey up and down the Ecclesbourne Valley in a three coach train hauled by a splendid steam locomotive and the ultimate accolade for me was to be instructed when arriving at home to get into the shower to remove then smuts from the journey. Memories! The crew of No3 had a supplementary but most important role and I thank them for their support for the days experiments. It does make the efforts of so many so very worth while and I trust that everyone that participated enjoyed this slightly unusual day. Much cooler than of late but nobody was deterred. The DMU team applied the numbering to the Class 108 and filled the centre car toilet tank up, they were flushed with success. The LMS Third Open was shunted into the set ready for the opening as well. The LMS brake van had more parts ground of it whilst the Day with a Driver guests enjoyed themselves riding down the line alongside the 78019 crew on their route learning mission. The booking hall had more paint splashed around. Another most satisfactory day with the highlight being an announcement from the Duffield platform team that all has been completed. Their energy and dedication will be remembered for a long time and they have a most fitting memorial to all the work. I attach a couple of photos unencumbered by people or trains that show the end product in all its glory.Very well done! Alan reports he has also now completed the refresh of the paintwork at Idridgehay and he also deserves a vote of thanks for tackling this single handedly. This is a popular photographic vantage point and his handiwork will feature a great deal in the coming weeks. More painting at Wirksworth with the Booking Hall receiving an exterior makeover after suffering the ravages of a harsh winter. Engineering has also featured today with the manufacture of steelwork to mount the lever frame numbers at Duffield and Iris having its speedometer returned to active use. Hydra and Tommy will be leaving us on Monday for use elsewhere and there has been a stripping of any useful parts before their departure. The lone bolt fettler has been putting the results of his work to good effect with 20 fishplate bolts replaced in the Hazelwood area and two surface drains through ballast cleared. Cleaning of our coaching stock also featured helped by the restoration of water supplies after two days without this essential commodity. Rather a lot to do in all areas over the next seven days so if you can help please come on down. A sight I suspect many of us thought may never happen, but it did, 78019 whistled and proceeded to Duffield to check that all the clearances along the line where suitable for the locomotive. All was well and a second run followed with many gazing on in amazement. These runs were fitted in with activities along the line by the PWT and VCT causing the two landrovers to climb on and off track a number of times. However, the PWT managed to replace one of the footpath crossings out of the three to be achieved and the VCT erected three banners announcing the opening and returned to the Duffield fencing project. The LMSCA continued with a number of interior finishing jobs in the Third Open and Ernie started the process of lining out the exterior. A start was made on sparkling up the Class 20 for its supporting role on Royal day and the carriage interior cleaning continued apace. Much activity on the underlying bureaurocracy continued to great effect and the Booking Hall processed more bookings for the opening weekend. Rod and Mary who have been undertaking a marathon makeover of the waiting shelter on Platforms 2 & 3 have completed their task to a very high standard. Another example of unsung heroes that keep our show on the road. The tender of 78019 arrived this morning and was joined, not easily, to the locomotive and the ensemble moved to the pit road. I am providing you with a photo of the loco on shed at Wirksworth. Truly an event of great moment. The PWT had a mixed day as they released an essential component for Duffield from the pointwork north of Cemetery Lane bridge and dealt with a load of lighting up timber that came from the now redundant umbrella platform at Idridgehay. The excess paint was cleansed from the Saloon windows with the aid of the coach being moved from Platform 1 to 2 and back again. The Booking Hall continued the good work of processing booking for the opening weekend and the Komatsu and Road/Rail dumper were returned to Wirksworth after their sterling work at Duffield over the last few months. There was a lot of background noise that seems to accompany anything to do with steam locos who seem like spoilt children constantly demanding attention. Tomorrow hopefully will see more productive work with the VCT applying poster boards to previously prepared sites and the PWT dealing with the three footpath crossings that require retimbering. 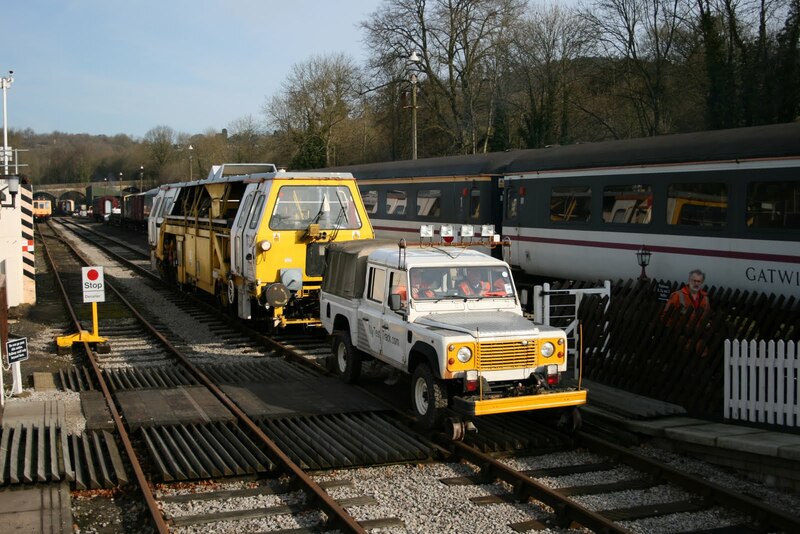 To that end any PW volunteers available should report to Wirksworth and the size of the assembly will determine whether the task can be completed by Landrover or Works Train. Close co-ordination with the VCT will be required. The incentive to attend as workers is that at some stage they will witness 78019 on its first excursion to Duffield and this remarkable opportunity is not available to anyone not participating in real work. There are still some seats available for our special celebratory Grand Opening weekend, so if you haven't already done so, why not pre-book and join us on what promises to be a very special occasion? The last date to pre-book for ticket delivery by post is before 16:00 on Thursday 31st March 2011. The last date to pre-book for ticket collection on the day is Monday 4th April 2011. To anyone at all interested in the activities of the Ecclesbourne Valley Railway today was very exceptional. At Duffield the platform was surfaced after months of very hard work to achieve a basic structure that can be finished by a layer of ashphalt. At the same time the instant lawn that arrived last Tuesday was laid on the prepared area but we remain a little short of turf which I have agreed to fund to complete the job. All concerned in this great adventure can take a bow, a job very well done. The Duffield fencing project entered its final stage with the hanging of three gates and the application of more palins. Again, a most professional job that completes the Duffield picture. Paint was applied to the fencing at the north end of the platform until supplies ran out. Wirksworth was not without significant activity with the DST painting and assembling parts for Henry Ellison and the extremely dirty job of preparing the Llangollen tank wagon to receive clean water. The sight of the team involved in this project had to be seen as the tank wagon harboured a dense layer of thick oil that has to be disposed of. If they were bird the RSPB would be mounting a rescue mission. The LMSCA had much reason to bask in their achievements as the coach approaches completion. The results of their labours are quite spectacular and it will be very difficult to pursuade passengers to leave the ambiance of the vehicle. There was much cleaning of the Saloon and the dmu fleet lead by Fred, Iris and June. June has majored on the dmus and would desparately like some help next Wednesday and Thursday. Our passengers may be engaged by visiting steam locomotives but will be very aware of the vehicle they are travelling in - presentation and cleanliness is all. Lastly, the arrival of the front part of 78019 this afternoon, for me, really marked an event that was undreampt of ten years ago and signalled the start of a great celebration of the achievement of all the volunteers that have made the opening of the whole line possible. The second part of the locomotive is due tomorrow morning! Neil has provided a link to the loco unloading process which I hope to interpret correctly - http://www.youtube.com/watch?v=Sxlnr-Qe1NU - and I have added a couple of photos that are extremely warming. I have attached a few images taken on Sunday afternoon. 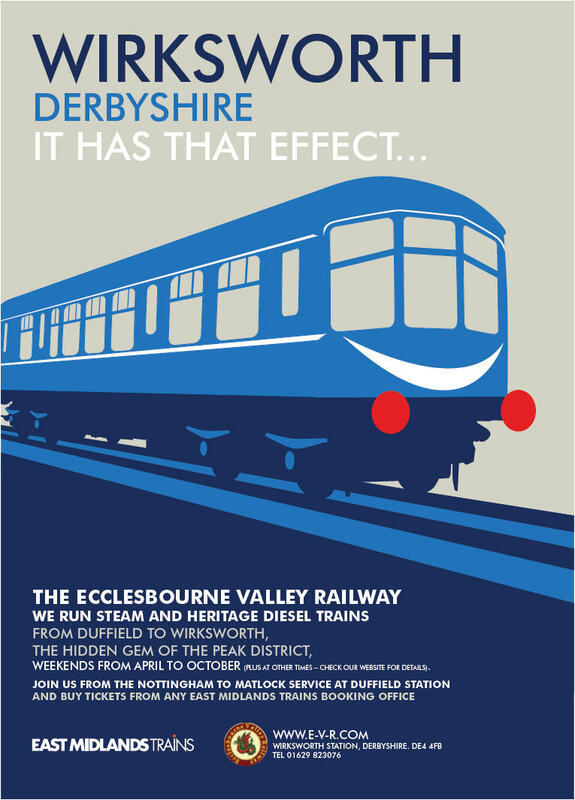 Your Marketing Department was returning from Derby Station, where 60 of our new posters were delivered to East Midlands Trains and was greeted by the magnificent sight of a five-car DMU in the platform at Duffield. The DMU in the freshly-prepared platform. By this evening, the platform will have received a layer of tarmac. Here we see a view of our train next to the Matlock - Nottingham service. 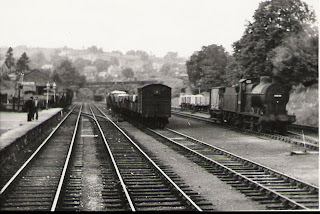 Below, we see the train in the platform from the run-round loop and then the following three images are of the formation returning to Wirksworth, seen just to the north of Hazelwood. The lone fishplate bolt fettler achieved another 24 today and is well aware he is saving further expenditure at a time when the rest of the world is trying to spend the Company's funds at an ever increasing rate - pass me another valium. John and Vince entertained today's Group Drive a Diesel Day clients to great effect and they all went away pleased with their time with us. Rod and Mary continued their marathon refurbishment of the waiting shelter on Platform 2 and 3 and the kitchen area of the Saloon had a further coat of paint on the ceiling. The garden border along Platform 1 received further attention and the EVRA shop is being prepared for the opening weekend. The LMSCA were in full production as the vehicle's entry into traffic is only 6 days away and the team at Duffield installed the cabling to the Midland Railway lamp posts for their eventually illumination. The Booking Hall dealt with today's guests and fielded a growing number of telephone enquiries truncating the traditional mid-day nap. Tomorrow sees the main area of activity concentrated on Duffield. Those attending are reminded to bring their rakes so that we can conclude the surface and its associated lawn. Apart from the train crew the permanent way team are asked to go directly to Duffield where there are a number of tasks at that location and, if possible, to north thereof. have been quite, quite exhausted. sections of slightly pre-used angle iron fitted. Mary show carried on with the marathon painting of the platform shelter. primed today to keep the rust off. Another gloriously sunny day with many small tasks achieved in the run up to the opening, with a team even finding time to entertain BuyAGift guests who thoroughly enjoyed themselves. The DMU team rectified a fault with the cab start buttons in the 108 and primed their new step boards, cut and shaped by the LMSCA. A thank you to them in this busy period. They too were found staining various parts of the coach. It looks a treat. On the subject of coaches, a small group worked on grinding out rusty patches of the BSK. A visit to Wirksworth was made by Team Rodders who reported that he had watered, upon instruction, the Instant Lawn at Duffield and then covered it in tin foil. It doesn't look like much but it is very hard to write about the multitude of jobs being done to ready everything for the grand opening. A most valuable job, that has been slightly neglected as we Dash for Duffield, has been achieved with the oiling up of all the point slide chairs in Wirksworth Yard including the Wash Green crossover. Iris received an "A" exam and many small jobs undertaken on the dmu fleet. A lone worker in the Third Open made further inroads to the assembly of the seating and cleaning of the recently arrived tank wagon made slow and steady progress. Much more work was moved forward with our record keeping and the final draft of the revised Rule Book put to bed. This will be available electronically in the near future and both Stuart and I thank June for all her hard work as she made sense of our many amendments and thorough reorganisation of the document. I am very pleased with the new document and, whilst not perfect, is a considerable improvement on what went before. 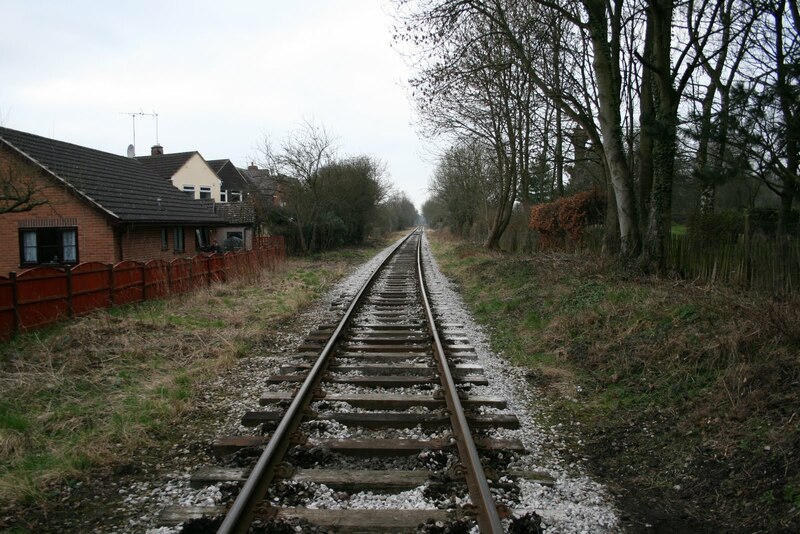 The plot for next week is that Tuesday will concentrate on Duffield with modifications to the loop points at Duffield North that were disturbed by the tamper, lawn and surface laying on Duffield Platform and completion of the fencework. If there are enough people we will move on to replacing the timber in three foot crossings that was uplifted for the passage of the tamper. Wednesday will see further permanent way jobs tended to, replacement wooden sleepers dropped off to replace some attacked by the tamper and a gathering of lineside material. Thursday will see fishplate bolt replacement continuing. There still remains a great deal to do before the opening and all are welcome to participate. The LMSCA put another full day in with further seat installation and more manufacturing of parts. 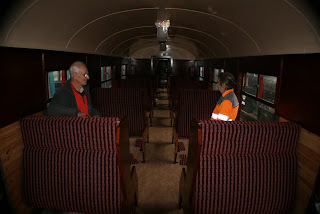 Electrical work also progressed and the woodwork in the coach received more stain. The stain was also seen on the applicator. 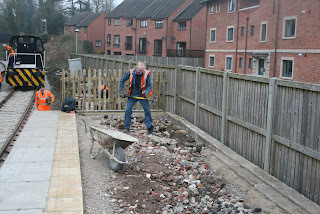 The Duffield Platform project involved the aid of a mini digger and roller. The platform surface is as ready as it can be for the surfacing work next week and the riddled soil has been spread so as to accept the turf for the area to be grassed. There is another general appeal for rakes and their supporting people next Tuesday as we would like to complete this task before the turf dries out. The ceiling of the kitchen area of the Saloon has been undercoated and the fencing around the Information Centre and EVRA shop has benefited from some attention. The border at the south end of Platform 1 has been the subject of much tidying and the Booking Hall continued to process opening weekend bookings. The point rodding at Duffield North Junction was adjusted following the realignment of the track by the tamper and all is now reconnected to the ground frame. 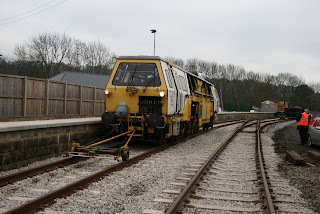 The Works Train was returned to Wirksworth and, after collecting a Lowmac from Shottle, removed the detritus from Shottle platform produced by the lift expired ramped platform area. I will detail tomorrow the projects to be achieved over the next two weeks which will really decide whether we are in a condition to open as planned the week after that. A quick comparison of views of Duffield taken in February 2004 and today, 16th March 2011. What a difference in seven years! Another exceptional day with around 50 people at various locations and I start with Tony Watts and his team who have, over the last two days, been attending to the very mundane but essential replacement of fish plate bolts many of which are incorrect for the track they have been used on. Our rail is all flat bottom from the south of Wash Green bridge at Wirksworth and there are specific bolts for this track. BR seem to have used "bull head" bolts occasionally and these are steadily being replaced but we are rapidly running out of them. Anyone got any put away in their garage or shed? 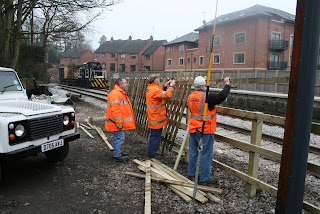 Network Rail returned on another team building day and tidied up the ballast north of Duffield without the bonus of experiencing Ferrybridge No3 later in the day. The VCT, fencing department, continued to stride forward at Duffield and the effect has transformed the place. 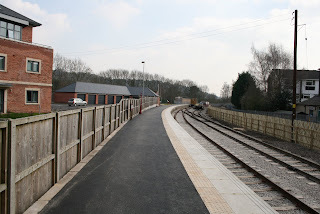 After an inspection in connection with the Royal opening further fill was collected from Wirksworth and applied to Duffield platform. The lamp posts previously planted were painted and the flagpole erected at a position of the team's choice. Riddled soil was moved to the area ready for the lawn and this was the last riddling day as our own version of Wimbledon will be laid tomorrow. 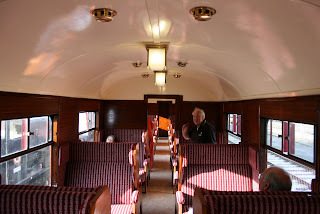 John Allsop has put a magnificent cream finish to the Saloon's ceilings as recommended by the LMSCA and all it needs is a few smokers to give that unique patina so deserved by the vehicle. The LMSCA have been beavering away with the seating in the Third Open and the Booking Hall has been processing more opening bookings. We have entertained the Royal Protection Officer and representatives of Derbyshire Constabulary to ensure all our planned operations are acceptable and I am pleased to say the visit passed without problem. It all seems a far cry from cutting the first tree down in Wirksworth Yard but I think the end product will be very memorable. Just learning the limitations of posting pics so the previous message seems quite strange! Hope the next two pics make more senese of the message. Another extraordinary day with 60+ people at various locations on our Railway. 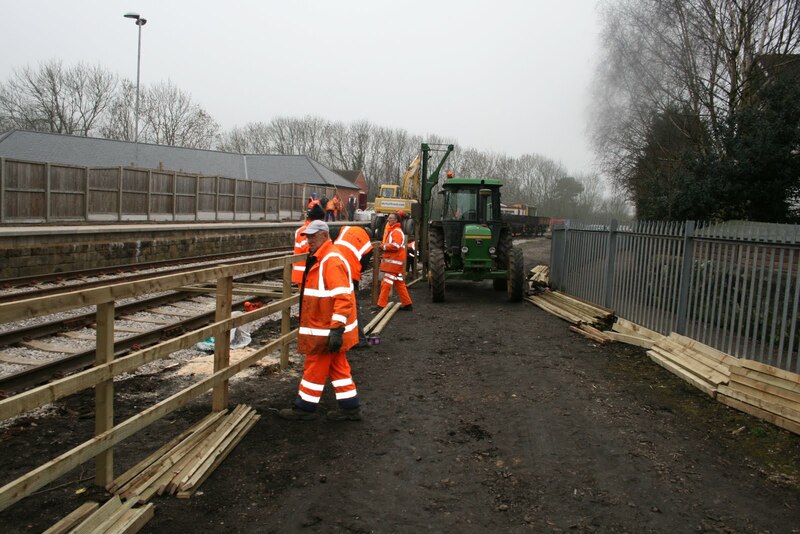 The most visible teams were the VCT and PWT that had a mass attack on Duffield with further fill and rolling of the platform and spectacular and speedy progress on the fencing that will separate the running lines from any future car parking opportunities. The VCT also managed to sub divide into a further team that moved brash to the burning site and ignited a super fire to consume the debris. There was a most positive response to the appeal for rakes which were used to very good effect on the platform fill. The accompanying photos show that a little rock breaking helped the filling process. We also benefited from a Network Rail team on a team building day who completed 100 yards of ballast fettling before enjoying themselves at Wirksworth with a special steaming of Ferrybridge No3. The DST didn't just enjoy themselves, or so they said, but continue to paint parts of Henry Ellison and extracted previously stored tubes for the loco so that the 8F group can get to grips with retubing the boiler. Fred and Iris conducted their weekly deep clean ritual of the Mess Hall and maintained the upgrading of the Saloon. The LMSCA achieved further miracles in the Third Open illustrated by a pic that doesn't do their work full justice but you can see John and Allison admiring their work. The Works Train returned the Rudd to Wirksworth this evening and positioned it in the Wash Green Dock for further platform fill to be delivered tomorrow. I telephoned Graham Walker this morning with a question and was delighted that the phone was answered by Ann who is now home and being tended to by visiting nurses. A very good recovery and a good sign for the future. Monday used to be a day of quiet reflection and I am sure it will be after the next few weeks excitements. However, today has been another day of intense activity with the LMSCA taking the lead in jobs achieved. 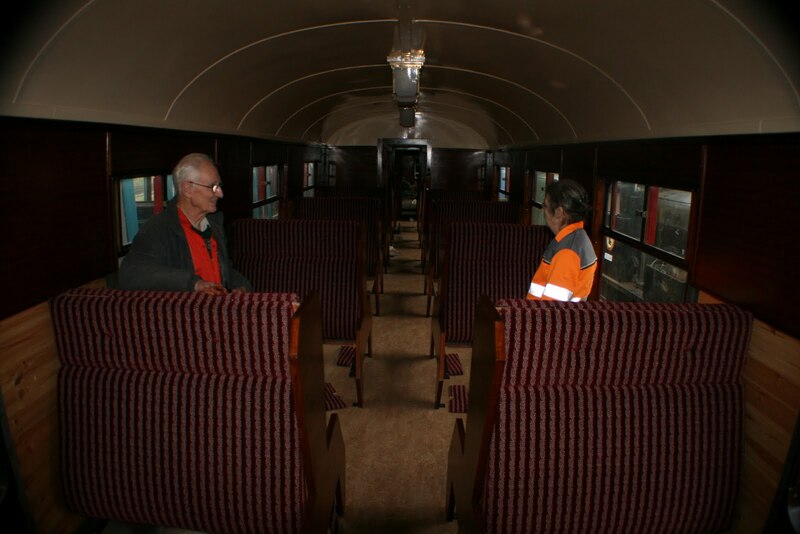 Varnishing has been completed in the "large saloon" together with the fitting of seat backs and headrests. Wood armrests have been manufactured and a start made on the cross lobby. Skirting boards for the toilet lobby have been produced. The LMSCA team have rarely been away from site over the last few weeks and are in sight of the finishing post. All their efforts will be rewarded as they bask in the compliments that will come their way in about three weeks time. I do feel a deadline for completing the BTK would be ever so helpful! A lonely fishplate bolt fettler completed another 25 to add to the 30 achieved yesterday. Hard work but saving significant expenditure in these hard times. At Duffield the team pressed forward until lunch called for some of them. 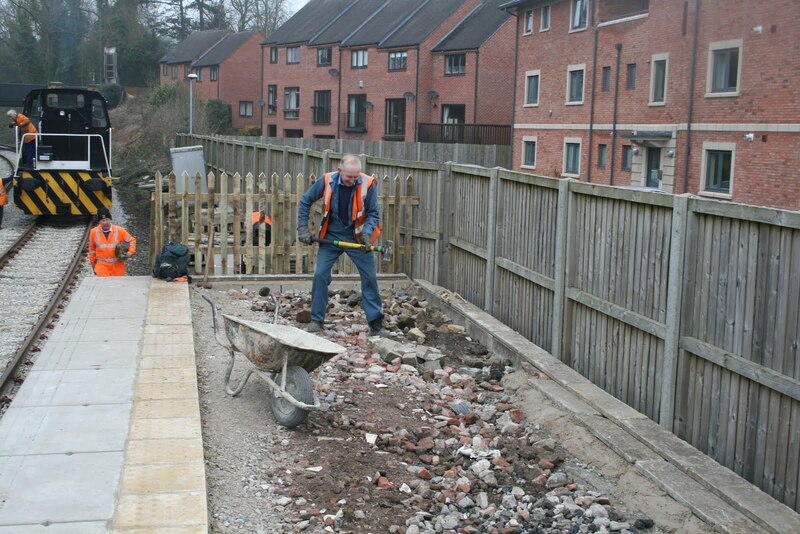 Nonetheless, further preparation of the platform continued and the Midland Railway lamp posts had electrically boxes fitted before they are planted. I was relieved that the welders completed their work today and the "long welded" section between Idridgehay and Shottle is again welded into one section. This section of line will haunt us for a little while as we will have further wasted rail to deal with in the not too distant future together with stressing the rails in the warmer weather. The SK had more work to its toilet system and the Booking Hall dealt with an ever increasing number of phone calls. The Chairman and I were seen cosily reviewing our Safety Management System which I can say is not the most exciting task but very essential to opening on time. PS All hands to Duffield tomorrow please and there is a general plea to bring a rake with you as the instant lawn is due for delivery. To inspire you I attach an interesting, I think, pic taken during a railtour to Wirksworth some years ago. I am not sure of the date but it was taken by Chris Thornburn who has been Membership Secretary of the Tramway Museum Society for a great number of years. Just a note to let you know that tickets for the Royal Saloon on selected dates after the Grand Opening weekend are now on sale. Tickets are priced £25.00 each return and are also valid as a Day Rover on the Ravenstor incline. Tickets are only available to pre-book online at http://www.e-v-r.com/book/saloon/ . Any remaining tickets will be sold on the day. We are now less than a month to the Big Day and I thought it might be worth summarising just what the Marketing Department has been up to. You will have seen the poster (attached) that has been designed by Orange Box Design of Wirksworth. 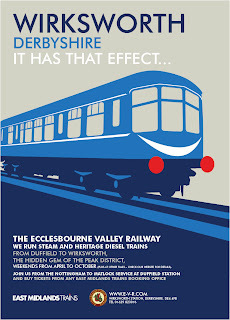 It will be going into over 50 East Midlands Trains stations and will also be used for advertising campaigns in Rail magazine and Railway Herald. Meanwhile more traditional advert have already appeared in Railways Illustrated and Steam Railway and the next edition of Heritage Railway. We have other adverts in the pipeline, while we are also going after editorial coverage. The April edition of Railways Illustrated has an excellent three-page article on our line and I would like to thank Tom Tait for lining this up. Better still, their reporter, Andrew Fowler was so impressed with the progress made by the LMS Carriage Association that their next edition will contain a piece just on the LMSCA’s progress here at Wirksworth! We have significant articles appearing in the next editions of Heritage Railway and Railway Magazine, so keep a watch for the first of these coming-out this week. I am expecting more coverage in the next edition of Rail, while Railway Herald is also covering us in the next couple of editions. Meanwhile, we are producing and distributing around 10,000 leaflets that will find their way into houses, shops and exhibition spaces in the locality and even into subscription copies of Heritage Railway and Railway Magazine. To complement our posters, we also have a new mascot! Winston the Wyvern is a family-friendly mascot based upon the railway’s logo and will be debuting on some new banners that we shall use to publicise the railway in the locality. He will form part of a series of promotional materials in the offing that will be aimed at children and families. In the next few weeks, you should also start to see one or two banners popping-up to publicise the opening, while it is also very important to acknowledge the work of John Hastings-Thompson in developing a relationship with Bachmann that not only has brought to market a beautiful 4mm model of a wagon from one of Wirksworth’s quarries, but provided us with extremely good publicity in the modelling community. This will come to a climax in May when Bachmann are staging an event at our line on the 21st of the month. John also ran the very successful leafleting exercise at Morrisons in Derby last weekend and again he deserves recognition for his efforts. There is still much work to be done. Last night I went to a railway society dinner in Stockport and as you can imagine, I was in ‘sell mode’. Taking a straw poll of the other diners, while some where extremely clued-up about our activities, others were blissfully unaware. We can never rest on our laurels! Therefore, this email concludes with a request. PLEASE do all you can to help us get the word around: download and print the posters and flyers; if you need large volumes, just email me direct. Similarly, if you participate in any of the online web forums (National Preservation, Rail Forums or Railway Forum), please contribute to the threads concerning our line and help keep us near the top of the listings! these cost us nothing but they do provide us with the oxygen of publicity. Thank you for your time to read this: hopefully it marks the start of a veritable torrent of coverage for our line in the near future. which cleared to a lovely sunny day. involved. For all intents and purposes it is now ready. In the weighbridge 30 sets of fishplate nuts and bolts were fettled. following this marathon of cleansing. After this it received new decals. Higham Enterprises assisted by Captain Jack polished the bogies of the SK. discs, continued to be chipped away at. Captain Jack going up and down the yard with big lengths. Mary Show until we ran out of Magnolia. Many achievements today to gladden the heart. Alan Taylor who has been single handedly restoring the fencing and gates at Idridgehay has had a further day of progress and pointed out that I hadn't noticed his efforts to remove the verdigree from the Down Distant Signal Board. I, of course, apologised for this oversight! The dmu team have largely completely the installation of seats in the Met-Cam centre car giving us a high capacity three car train that should be able to cope with the most ambitious days in 2011. There is even space for a catering trolley which I hope will be introduced at some time soon. The extra special permanent way day today occupied the four brave souls that completed the "stoning up" of four footpath crossings. This was commended to us by HMRI as it avoids the placing of half timbers and produces a completely non slip surface. The Midland Railway lamp posts have been delivered to Duffield platform so that the necessary electrical connections can be laid in before they are lifted into place. Open "man holes" north of Shottle have now been covered and the clamp plates removed from the new rail inserted in the previously long welded section removed. A trolley was positioned so that the welding team can have an early start to reweld everything up again. Be aware that this exercise will cost over £7,000 and wasn't included in our plans for 2011. A little cry of surprise emanated from Duffield as Rodney realised that his cabin had been loaded to a rail vehicle and was reminded that this was a fast moving scene as we approached opening day. I think there are now only three riddling days left. A most productive and useful day. Those of you who are shareholders will find two extra steam hauled trains on Shareholder Day loaded to the web site in response to demand. I am sure you will join me in wishing Ann Walker a speedy recovery after seeming to have a slight stroke last night. She is being cared for at Derby Royal and further progress will be reported as news comes in. A most satisfactory and productive day as we home in on the key outstanding jobs. The PW team tended to Shottle North Junction and reconnected the points to the ground frame after the ministrations of the tamper. Necessary adjustments were made and the facing point locks gauged and proved satisfactory. An eight man team dealt with the southern breather switch of the long welded section involving the unclipping of some 100 metres of track and then clipping it all up again. Opportunity was taken to put new pads into the majority of there area unclipped preserving the life of the concrete sleepers there. Drain covers made from recovered sleepers were cut to size and, if all goes well, will be placed tomorrow. The breather switch is designed to permit the welded section to expand and contract without the track buckling by means of a sliding process. A major task that has been very well done. After the change of corroded rails under bridge DJW 6 lift plates were fitted today, these deal with any step if the rail head profiles are different through different rates of wear, and the remaining rail joint held together by a clamp was adjusted to fit a conventional fishplate. My thanks go to today's team who have dealt with some critical requirements before the opening. There will be an extra day of permanent way work tomorrow with the Works Train leaving at around 0930 from Wirksworth to make the necessary provisions for the welders arriving on Saturday and attempt to restore the foot crossings taken out to facilitate the tamper operation. As ever, all welcome! 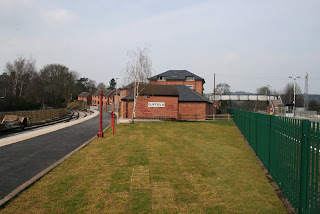 The Duffield team have installed the Duffield Station signs along the platform together with the interpretation board. They also concreted in the bottom post of the new fencing erected by VCT at the north end of the platform and the handrail down the staff steps. VCT also received an inordinate amount of timber for the fencing to be erected at Duffield next week and the lone soil riddler was reminder that there are only five riddling days left before the lawn arrives. VCT also managed to move a further eight loads of brash for burning and reported one large fire. Three cheers to John and Joe who have dealt with the toilet in the Saloon which had suffered burst pipes and nearly completed the refurbishment of the operation of the two toilets in the SK. Further work was achieved to the ceilings in the Saloon and there was some discussion as to the presentation of the toilet seat in case there needed to be a Royal flush. This represents the ultimate joys of volunteering. The SK also received further deep cleaning and I am sure the coach has not received so much attention for decades. The Booking Hall continued to process bookings for the opening weekend and Robin is working on placing Royal Saloon bookings on line for all the dates that 78019 is with us. The process of dealing with issues presented to us by HMRI continues and many people are working behind the scenes to remedy any perceived deficiencies. I would ask to welcome Bob Swepstone into the fold as an about to retire Permanent Way Engineer for Network Rail. He will be examining the rail conditions over the next few weeks so we have an audit of track conditions deemed very necessary by HMRI. He has also organised a couple of Network Rail training days next week were groups will do a little ballast bashing starting from Duffield on Tuesday. It's all about team building and bonding so I am told - I feel very old. PS Just to emphasize there is another PW opportunity tomorrow and it would be good to polish off all the tasks planned. I will address an omission from yesterday and add today's endeavours at Duffield where now have three "holes" in the platform to accommodate the Midland Railway lamp posts kindly donated to us by Laurence Knighton with a view to them being planted next week. There has been quite a lot of preparation along the platform and associated area ready to receive an instant lawn next week and put the information board back for viewing with the concrete preventing further movement. I have advised the Duffield team they can plant the flagpole at a position of their choice, or something like that. Lewis and Richard entertained a Drive a Diesel Day client who thoroughly enjoyed his day with us. The team had arrived early to ensure the Works Train could be in position at the rerailing site and L J Breeze returned in time to gather up the client. 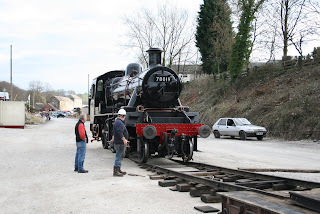 At the end of the day the Works Train was retrieved and the combined group returned to Wirksworth. The PWT completed the insertion of 7 new 60 foot rails into the long welded section and found some lift plates for yesterday's rail replaced under bridge DJW6. Sundry other PW jobs were undertaken so that we are ready for more activity tomorrow as we gradually narrow down the outstanding tasks. Coaching stock work featured at base today with Joe and John achieving some remarkable repairs to the toilets in the SK and you have to say that volunteers that spend their time repairing toilets deserve special thanks. Another John undercoated the south end of the Saloon's ceiling as we prepare this vehicle for its Royal role. Another team gave the SK a deep interior clean ready for playing its part in the opening celebrations. The LMSCA strode forward with a myriad of jobs in the Third Open with particular attention to finishing work and applying skirting boards to the lobbies. The Booking Hall welcomed our Drive Diesel client and guests and processed more opening train bookings. Catering provided lunches for our clients and the train crew. Much supporting paper work was pushed around the desk and more tests set for our specialist drivers. Another day of very solid progress towards our objective with quite a convoy leaving Wirksworth for the south. The Landrover, Komatsu and Works Train headed off for two major rerailing projects. The first of which was to unload to rails to replace the corroded ones under bridge DJW6, or Derby No 4, and this was achieved so that the defective rails can be eventually returned to the test area of the Gorsey Bank line. The major task of replacing some 113 metre of side cut rail commenced with the track severed and three "new" 20 metre sections inserted and plated up with clamps. This is major work for us and great credit is reflected on the PWT who attended in some strength to make it all happen. This work will continue through the week and all hands are welcome. The Works Train will leave Wirksworth at 0900hrs tomorrow so the LJB can participate in a Drive a Diesel Day starting at 1000. The VCT cleansed the area between the A6 bridge at Duffield and the footbridge entailing two large fires at the burning site. Without the draw of free clothing the gang size had diminished to a magnificent five. Rod and Mary continued their refurbishment of the waiting shelter on Platforms 2 and 3 at Wirksworth and the Saloon interior ceilings were scraped and primed ready for further attention as the week progresses. The DST declared Ferrybridge No3 ready for service having polished and cleaned the locomotive. They hope the operators of the loco will be equally house proud and will now turn their attention to further work on Henry Ellison. After the Saloon ceiling scrape, Fred and Iris set to with the vacuum clearer and restored some sense of order. They will return next week for some serious polishing and woe betide any further creation of mess in the vehicle. We were able to multi task today as we had a Group Drive a Diesel Day and numerous shunting jobs to achieve. There was a joint effort with the Komatsu to load two rails from Gorsey Bank onto the Sturgeon with replacement of rails under DJW 6 later on during this week. The team then went on to move the recently repainted Saloon and the SK to Platform 1 necessary for the ceiling to be repainted in the Saloon and the toilets to be made operational in the SK. After lunch our guests were treated to a journey to Duffield with the Class 20 and at the end of the day preparations were made for tomorrow's activities. It is a lot of work for Richard and Hylton who looked after today's guests but it is a most productive and entertaining use of their day with us. I had a slightly surreal start to the day as the lone figure of the Lord Lieutenant of Derbyshire appeared somewhat early for a planned meeting but we coped with warm welcome. The procedures and timetable was finalised for the Royal visit and we now only have to be assessed by security. The LMSCA were in full cry with a report that all light fittings are now complete and further installation of seating. The "new" tank wagon purchased from the Llangollen Railway is now turning black as its top coat is applied. The Booking Hall had an unusually busy day for a Monday and there was no time for a gentle nap at lunchtime. Another pleasantly productive day as we inch forward to the final deadline. DMU vehicles which have formerly arrived at our famous establishment. Meanwhile, the two car DMU set received its routine "A" examination. upper embankment and were also occupied laying out the vegetable garden. A strange sort of a day where the DMU team pottered about in their 180 foot long rail-mounted mobile garden shed. Tasks completed included looking at various odd jobs that needed doing to ready the vehicles for service, the painting of the seat plates and a start was made on clearing out all of the unwanted items that are left over from the restoration. A moment was had to reflect on the 2 years that had passed during the restoration now the end is in sight. It is both a very exciting time and also a sad time as well. One can remember the many joys and frustrations that have taken place along the way! Interestingly, the LMSCA were in a similar sort of mood. They were seen in the mess room with large smiles on their faces, having installed all of the seat frames now! This is a major milestone. Underneath, the drawgear was adjusted to allow for a smoother ride. Some ballast was moved from the track around Platform 3 and by the same subject of track, the tamper departed for its next challenge. The 8F group were doing something mysterious inside their coach as well. Oh, and Richard Hatch made the tea. The main achievement today was the arrival of the tamper at the end of the line to complete its work with us so we now have a railway that is level and will provide an experience where the drinks won't spill. The team from Rail Support Services have delivered what was promised, at a price, with calm professionalism and the machine is in the Car Park ready for its next task. There are many thanks due to the various people that created the opportunities for this process to be successful. The PWT supported the tamper operation needing some disconnections at Duffield North which has left a few post tamper effects to be remedied. Back at base the necessary plates to allow the seats to be fixed in the Met-Cam centre car were delivered and work strode forward and 32 seat bases have been painted with primer. Graham has been oiling the axle boxes of the Royal Saloon and wrestled with the windscreen wipers at the north end if the 3 car unit. There was activity in the creating of a new picnic area from the end of Platform 3 and the Head Gardener had an assistant for part of the day. The was some action from the LMSCA and a visit to this vehicle with a journalist revealed the seating beginning to come together. Alan Taylor was a lonesome figure as he sparkled up the paintwork at Idridgehay and I conducted the welding company to site where they will have to work at the end of next week. Not a bad day with a sigh of relief that the tamper has done its stuff. Two photos attached to demonstrate that machine had arrived at is destination together with an illustration of the long straight north of Duffield that looks very similar to Neil's early poster designs. We welcome Chris Milner from Railway Magazine and were happy to renew our relationship with the publication. The Mortons Group which now includes Heritage Railway and Railway Magazine are joining us as joint sponsors of the opening so we should get some very good coverage in their respective publications. The PWT followed the Tamper to achieve an amazing amount of remedial work with 45 fishplate bolts replaced or inserted where there were none, dealt with a rail joint that was secured by a clamp because the rail gap had become enlarged involving the adjustment of rails either side.Unfortunately a further problem joint had to be clamped leaving more tasks to be achieved in the near future. The Tamper achieved a further mile and finished today in the area of MP 134 1/4 leaving quite a demanding day tomorrow. Many thanks are due to everyone involved in this most important project. The VCT were somewhat inhibited by the Tamper operation but were able to concentrate on the opening up of views south of Hazelwood consuming the resultant brash with one large fire. Special thanks to Alan who has prepared and fixed his home produced bridge numbers to DJW 11, 20 and 23. The LMSCA were unusually verbally quiet today as they continued the installation of seats and further down the Yard the recently acquired tank wagon is gradually being painted gloss grey. Rail clamps were serviced ready for use next week with the re-railing project on the long welded section. The Booking Hall continued a satisfactory process of issuing opening weekend tickets generating very much needed cash. PS The forward schedule now looks like this - Tamper work completed tomorrow, rail loaded from Gorsey Bank and train prepared on Monday for next Tuesday to take all rails to site with the Komatsu in attendance. Long welded section cut and new rail laid with the welder booked for the following Saturday and Monday. 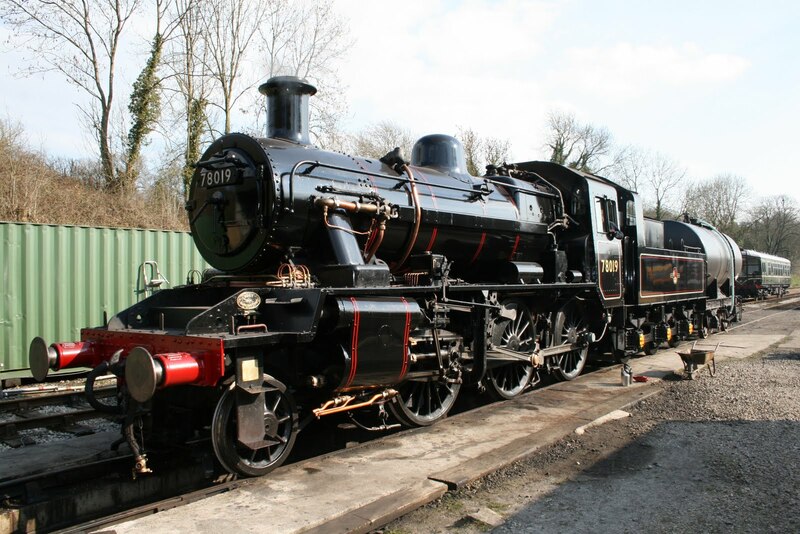 This coming Monday will also see the Royal Saloon and SK positioned in Platform 1 for remedial work. Another incredible day with some 60 people involved in a range of projects to speed us towards the opening. 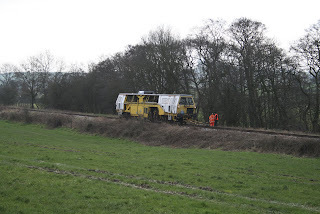 All eyes were on the Permanent Way Teams today as the tamper moved steadily forward to Duffield. Team one started at "Willow Crossing" north of Shottle and had the very unenviable task of clearing the sleepers of years of accumulated mud from soil washed down from adjacent fields. This team deserves a vote of thanks and I am sure they will benefit from Radox baths this evening ( and maybe a tincture). Another part of the Permanent Way team took the Works Train ahead of the Tamper and deposited more white gold beyond Postern Lodge Crossing before exposing the track fittings at Postern Lodge and Hazelwood so that the operator could see the sleeper spacing. The Tamper itself managed the section between the south of Shottle and the approach to Hazelwood, some 1 3/8 miles. Works Train and Tamper returned somewhat late for the EVR having had the joy of great achievements. The LMSCA were in full cry with seat frames fitted in the small compartment and window glazing bars sealed. All glazing mouldings were fitted and the welding of bogie struts achieved. The was a sealing of vents on the Mark 1 BSK as part of a long term project to return this vehicle to service and the Booking Hall continued to process a steady stream of bookings for the opening weekend. Hat's off to Tom Tait who has been walking the streets of Belper, Allestree and Quarndon to spread the opening word by leaflet drop. He has even talked his son into leafleting central Derby. To replace stolen items a happy opportunity arrived from Develop Training in Derby to purchase a replacement "Bance" and "disc cutter". More money out but at least we have the necessary equipment again. Many thanks to David for pulling this together in amongst the welter of other activities. Well done to everyone involved in today's work. Part of the end product is to see a railway that looks extremely good with smooth lines and gentle curves that we can be truly proud of. Lots more to do in the next four weeks but I am sure we are up to it. A very grave omission from today's report was my invitation to the hallowed ground of the Stanier Third Open were there was rightfully great joy in the installation and illumination of the delightful art deco lighting in the south end saloon. The ambiance of this vehicle can now be really felt and reflects great credit on the whole team with the tantalising prospect of the seating being installed from tomorrow. I also should thank the Passenger Services team that continue to process bookings for the opening days and tend to the myriad of jobs associated with welcoming our passengers over this first weekend. Unsung heroes that are going someway to earn the incredible amounts of expenditure that we have and need to commit to in the next four weeks. As we enter the third month of our brave new year there was a great deal of productive activity with the Permanent Way Team attending in considerable numbers, causing a little initial work planning problem, resolved by the team dividing into various sub groups. The tamper support team departed in the Landrover ahead of the machine and filled the cribs at Shottle North Junction. The Landrover then went forward with another team to remove foot and accommodation crossing timbers to give the tamper a clear run through. In order to release a couple of rails to replace some wasted rails under bridge DJW 6 the Gorsey Bank line had two rails of good condition extracted for transport next week. The Gorsey Bank group then went to Shottle to clear some of the mud off the south end of the long welded section disturbed by the tamper's activities. The tamper, itself, progressed from Willow crossing through Shottle North and South Junctions including the switch and crossings at both locations covering around another 3/4 mile towards Duffield. Tomorrow sees a relatively straight forward plain line tamp during which we hope to make up some time after the late start yesterday and an hour's downtime today due to a machine problem. The success at Wirksworth was No 3 passing its annual boiler examination after a lot of hard work by the DST. After receiving an affirmative the loco shunted the earlier loaded Dogfish from Wash Green dock and formed up the Works Train for tomorrow. The sight of No3 shunting loaded stone hoppers was quite a joy to behold and must be another first after around 50 years. The VCT had an amazing turnout with 9 members in attendance. This was attributed to a very large donation of PPE to which everyone could help themselves - the plus of free gifts and many thanks to Develop Training of Derby for thinking of us. Some 10 loads of brash were moved, more hedge trimming achieved and two very large fires created. Down at Duffield all our signage is now in place with many thanks to David, Chris and Richard. Fred and Iris gave their traditional deep clean of the Mess Hall which was in dire need of it!